Marking 50 years since the establishment of diplomatic relations between Israel and Germany, the presidents of the Hebrew University of Jerusalem and Freie Universität Berlin signed a joint doctoral program agreement. It is the first of its kind between German and Israeli institutions of higher learning and is open to all disciplines at the two universities. The Joint Ph.D. will create a cadre of graduates with international experience and a solid footing in both Germany and Israel. 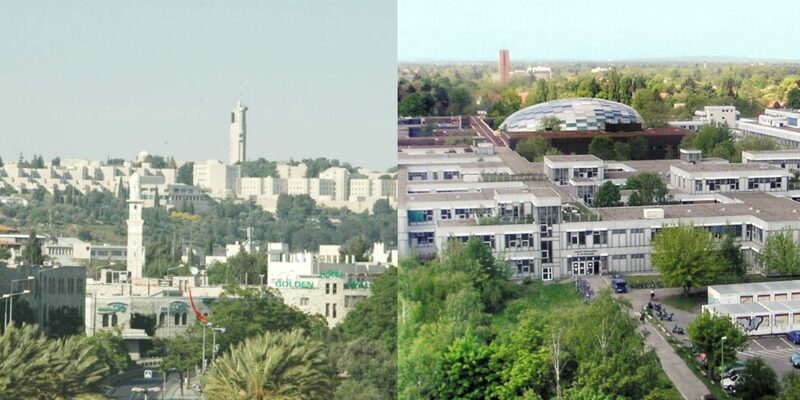 Alternate periods of research between one to two years will take place at Hebrew University and Freie Universität Berlin. Each student will have two supervisors, one in Berlin and one in Jerusalem. At the end of the program, the students will receive a joint degree from both universities. With this agreement, the two universities continue to strengthen their extensive strategic partnership, which includes numerous joint research projects in the natural sciences, humanities, and social sciences, as well as student exchange. In November 2014, the two universities signed an agreement to enhance cooperation in research and teaching, through the exchange of technical and administrative staff. Participants will benefit from the sharing of mutual professional best practices. Freie Universität Berlin and the Hebrew University hosted various cooperative projects as part of a program of events commemorating the anniversary year. They include not only workshops and conferences for scientists and scholars but also a lecture series in Jerusalem on the history of German literature from the Middle Ages to the present, which started during the 2014 spring term and concluded with a final event in April 2015. Furthermore, in a joint teaching project, students at Freie Universität and at Hebrew University are studying the history of the Holocaust. The future teachers in both countries will exchange ideas and information through the Internet, working together to develop teaching materials. The highlight of the class is joint field trips to memorials and memorial sites in Jerusalem and Berlin. The German-Israeli Research Training Group, “Human Rights under Pressure – Ethics, Law, and Politics,” a joint Freie Universität-Hebrew University program, opened in June 2015. Each year 20 doctoral students from each university will be educated within the Training Group. The Federal Republic of Germany and the State of Israel officially took up diplomatic relations on May 12, 1965. German-Israeli cooperation in science and research preceded and was a pioneering factor in the diplomatic relations between the two countries. Cooperation between Freie Universität Berlin and Hebrew University has a long history. In the 1950s, there were already connections between students and faculty at the two universities. The first official partnership between the universities was formalized in 1986, and since 2011 Freie Universität and Hebrew University have been working together as strategic partners. There are now numerous joint research projects in the natural and social sciences and the humanities, as well as student exchange programs. Cooperation with Israeli universities and dealing with Jewish history and contemporary culture in research and teaching at Freie Universität Berlin have both been important to Freie Universität since the 1950s. Shortly after the university was founded in 1948, the faculty and management undertook efforts to gain Jewish emigrants as visiting professors for the university. One of the first of these was the New York-based German studies scholar, Adolf Leschnitzer. The university administration hoped that just a few years after the end of World War II, it would be possible to “get over the horrible events of the past few years” and “pave the way toward reconciliation” through scholarly work and dealing with Jewish history in teaching. These reasons were included in a letter of invitation to Leschnitzer. During the first years after Freie Universität was founded, numerous other emigrants who had returned to Germany were hired at Freie Universität Berlin, including Ernst Fraenkel, a professor of political science, and Ernst Hirsch, a professor of law and intermittently rector and deputy rector of the university. In 1963, the first Institute of Jewish Studies in Germany was founded at Freie Universität. The decision to establish this institute was made in connection with the appointment of Jacob Taubes, who later became the first director of the institute. He was succeeded in 1979 by the historian Marianne Awerbuch, who had returned from Israel to Berlin in 1966 to write her doctoral dissertation at the Friedrich Meinecke Institute of History. From the beginning, the collaboration in research and teaching covered all the subject areas, including medical training. Established in 1918, Hebrew University is deeply rooted in the German-speaking scientific tradition. Among Hebrew University’s founding fathers are such luminaries as Albert Einstein, Martin Buber, and Sigmund Freud. In the years before World War II, many of Hebrew University’s institutes and schools were established and shaped by leading Jewish scientists from Germany, who came to Jerusalem either as Zionists or, after 1933, as refugees from the Nazi regime. Some of the more prominent names include Edmund Landau (mathematics), Gershon Scholem (Jewish thought) and Richard Koebner (German history). Since then the cooperation with German scientists and research institutions has been increasing steadily in all fields. Germany is now considered the Hebrew University`s most significant research partner in Europe, second worldwide only to the U.S.
Today, cooperation with Germany at Hebrew University is based on scientific excellence, bringing together top scientists in a wide range of joint research projects, as well as a growing number of students from both countries. Major collaborative enterprises include the Max Planck Center for Sensory Processing of the Brain in Action and the Martin Buber Society of Fellows at Hebrew University.